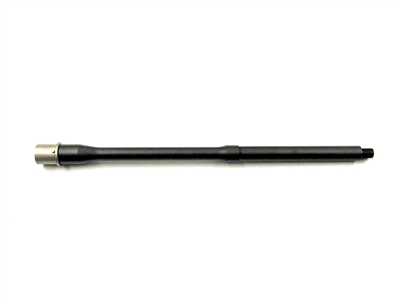 This 16-inch carbine length barrel is the perfect choice when you're looking for stellar accuracy with most bullet weights. Crafted from 4150 steel, it boasts a dark gray, military-style Parkerized finish to provide superior corrosion protection and wear resistance. Chambered for .223 and 5.56 rounds, this 16-inch AR-15 barrel features M4-style feed ramps that help ensure a smooth feed and prevent jams. The six-groove button rifling and 1:9 right-hand twist on this carbine length AR barrel provide for excellent accuracy. Please note that this barrel accepts .750 gas blocks. Crafted from durable steel, this is the perfect choice when you're looking for a .223 Wylde carbine length barrel with proven handling. Please get in touch with the friendly professionals at Pickett's Mill Armory if you have any questions about the compatibility of this barrel with other AR components. 10.5" .300 Blackout Barrel 1-7 Twist PMA Low Profile Steel Gas Block .750 with Tube installed 16" .223 Wylde 1-7 CHF QPQ Nitride SEEKINS LOW PRO ADJUSTABLE GAS BLOCK .750. I have not had a chance to fire any rounds through this barrel yet but it did arrive in the flashiest of flashes with no blemishes and all of the correct parts I ordered in some very secure packaging. CanÃ¢â‚¬â„¢t wait to test it out. I had this barrel recommended by a friend due to its ability to handle both .223 and 556. The ease of adding both a gas tube and gas block was extremely helpful and seemed intuitive. "Just selected a barrel? How about adding a gas tube? And a gas block? Low pro or standard?" I was impressed with the customer service response, Thanks Dan! My only recommendation might be to add a more expedient shipping option but my order only took two days to ship. I was impressed. Thank you for the high quality product, excellent customer support and timely order processing and shipping!